The various Libtard Leftists and other likely Democrats are making a big deal about the government shutdown – as if it’s something both horrific and unprecedented… and, of course, something to blame upon President Trump. 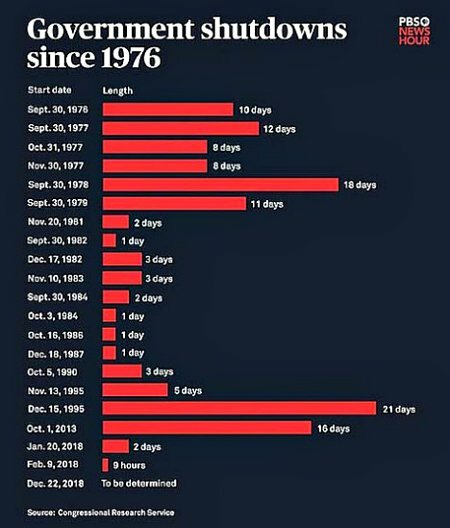 The funny thing, and what proves their real reason for complaining, is that such shutdowns have been a reasonably common occurrence since President Ford’s time. Ah well, it’s not as if our domestic enemies are sane or that Americans should particularly care about their whining. This entry was posted on Thursday, January 3rd, 2019 at 7:52 pm and is filed under Politics. You can leave a response, or trackback from your own site.